Having re-run five essays from the 2011 election cycle. I hope to post two more, including something borrowed from way back that harks to the time we were still respected, even courted, not for oil – which we did not yet have – and even though it was during the Cold War when Nigeria was a sort of “beautiful bride” and was courted by Russia and America, it would be apparent that THAT particular leader deserved the respect shown him. I present first, an essay I believed was already on this blog but has apparently never been posted. It’s about the kind of leadership Nigeria does not deserve. TOLA, WEDNESDAY, APRIL 8, 2015. Quite a while back, This Day carried a front-page editorial on a visit the President made to the U.S.A. The paper wrote about the President’s failed attempt to see President Bush after which the President also went to the State Department without prior notification to State in an attempt to see Secretary Powell, an attempt that also failed according to the paper. Before I go on further, Sir, allow me to recall a diplomatic faux pas I made as a social secretary to Nigeria’s Ambassador to Washington thirty years ago. I think Ambassador John Mamman Garba is now late but the real social secretary, a West Indian, had just left to get married and I was given that post, I guess, to put a Nigerian there. Though no greenhorn to secretarial work – I had worked as an assistant personal secretary in the office of Ife Vice Chancellor – I knew next to nothing about diplomat-ese but was working for food while I went to college. I was a locally-recruited staff which meant our tribe – Nigerian college students willing to take the low pay because of visa restrictions – earned pittance while the “home-based” staff posted from the Ministry in Lagos had a swell time. I had piled on some more years, knowledge and experiences not taught at Ibadan Polytechnic before I realized the gravity of that stomach-churning mistake. Yes, Sir, I still get that butterfly in the stomach whenever I remember that awful day. Sir, you have operated in the rarefied and dignified world of top diplomacy for a total of almost of ten years but you are an informal person, a very informal person who, it seems, try not to let the office of president cloud his carriage and social interactions. I must digress so that I am not misunderstood. Apart from a core group of nationalist writers, there seems to be two main classes into which most newspaper reporters and columnists in Nigeria can be classified these days: the envelope and post seekers AND those who see everything through the politically-expedient ethnic bifocals. I belong to neither. Readers of this column are familiar with my belief, for example, that only the Buhari/Idiagbon administration ever fought the perpetual onslaught of Western lending agencies to weaken the Naira. Even in my professional journalism days, I always wrote from the angle that appeared to be unbiased and truthful. Sadly, there seems to be few Nigerian newspaper writers left who play by those rules. To make the point more explicit that I have no hidden agenda, I am one of those who believe that you supply enough darts to any writer, Yoruba or otherwise, to be aimed at your administration. I can move on. When I read the editorial by This Day, like most Nigerians, I was humiliated but thought there must have been a serious gaffe committed by your protocol people on The Way to Foggy Bottom, seat of State Department. I remembered instantly what I put Ambassador Garba through back in ’73 and thought the big mistake emanated from presidency protocol. Nigeria’s outgoing Head of State, President E.G. 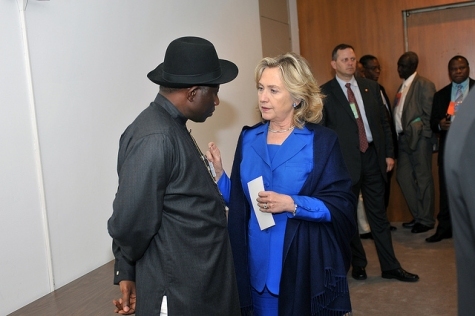 Jonathan and U.S. Secretary of State, Senator Hillary Clinton. A news item caught my eyes this past week (first week in November 2003) in The Comet but I must digress, again, in the African tradition to strengthen this letter. My name gives away the part of the southwest to which I belong by marriage where a massive egungun (masquerade), Gọgọru, gave birth to a saying which I love. In Osogbo, home of this masquerade, there is a saying that egun gọgọru l’a nb ẹru ... 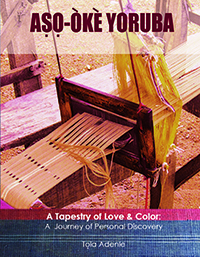 While I can only give a fair translation for the non-Yoruba and a ‘jẹ bọta’ readers – respect the message, even if not the messenger – I cannot, unfortunately, do justice to the play on words in a translation that would allow these two groups to really understand this saying. A direct translation, though, means whoever wears the garb of this feared masquerade becomes someone to be feared. “I was in Houston, Texas this morning (Thursday) and I informed President Bush that I was coming to your birthday anniversary, and he said I should convey to you this message,’ Obasanjo said before handing the envelope to his host. “My God” was all I was able to say as I raced from beginning to the end of the story taking in every word that pierced the heart like a dagger. The family foundation, as you rightly pointed out has played a very laudable role in the establishment and development of the International Institute for Tropical Agriculture (IITA) in Ibadan. The work of developing high-yield and low-maintenance seedlings for tropical areas of the world has been of great benefit to Nigeria among other tropical countries, and paying tribute to the grandson of the original benefactor of such an institution is a worthy undertaking but I believe you could have been there without being physically present through a worthy representative, government official or family. Now, carrying the senior Bush’s congratulatory card to Mr. Rockefeller? What does Nigeria need from America that the senior Bush would help with his son? Sir, you hold the position in trust for all Nigerians and it is a position that is greater than anybody who will ever hold it. During President Nixon’s Watergate problems in the 70’s, there was a television commentator, Nicholas von Hoffman, who called Nixon ‘a rat’ or something worse. It may have been a coincidence but I haven’t seen Mr. Hoffman on tv ever since. The American presidency is respected by all regardless of party affiliation and whoever occupies that position – “rat” or whatever – becomes a direct recipient of that respect. Finally, Sir and on a different note, I was at a funeral service in my native Ondo State early November. The main Anglican church in my small town (there are three others) was born of activism during the early part of the last century and has always lived by that tradition. Most of the pastors of this main church have always been of the tell-it-as-it-is mold. At a niece’s wedding in ’86 as General Babangida’s let-them-eat-from-the-trash reign got under way, the pastor announced as soon as he mounted the pulpit: a ti gbe, o! (we are in big trouble). The sermon was definitely no anticlimax. As soon as the current pastor had counseled the mourners the usual way, he lowered his voice, resting one arm on the pulpit while the other held his chin: “boya a ri ninu enyin alejo wa ti o ma nlọ si Aso Rock; ki ẹ ba wa bẹ Ọbasanjọ pe inira, ebi … l’ a nri lati Aso Rock” (there may be some of our visitors with access to Aso Rock, please tell the president that hardship, hunger … are what flows from Aso Rock)! The introduction, of course, was an excellent lead for that memorable sermon. I am not sure anybody close to you would deliver that unpleasant message, Sir; so here it is.